This is a beautiful piece. 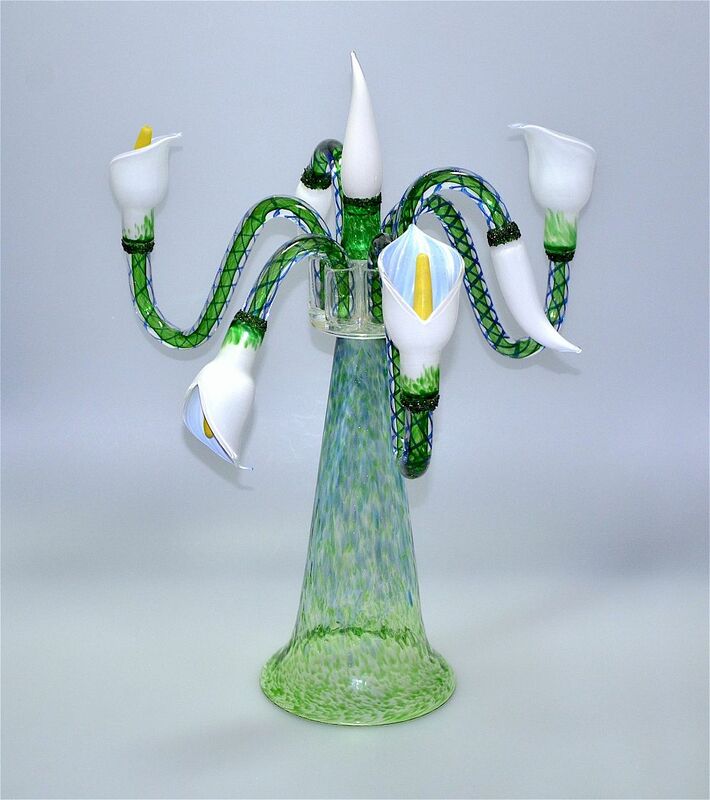 It was made by Michael Hunter shortly before he established Twists Glass and is know as "Spirit of Nature, Life & Light". The conical base of the centrepiece is in blue & green mottled glass. The top of the base has been engraved with small leaves. At the top of the base is a round clear glass platform with 6 clear glass cylinders positioned around a central clear glass finial. The 6 glass arms fit into the 6 cylinders. Three of the arms curve downwards and 3 curve upwards. All 6 arms are a wide blue and green cane and all end in a white arum lily some of which are in bud and some in full flower. The flowering arums have a pale blue inner and a yellow centre, which can be removed from the arum lilies that point upwards to allow a candle to be inserted instead. An arum lily in bud with a mottled green cylindrical base sits on the clear glass finial and can be removed and used as a candle snuffer. The inside rim of the base is scratch signed "M Hunter Spirit of Nature, Life & Light"
This is a very early piece made by Mike. We are always keen to see what Mike has tucked away at the studio and we had seen the advertising literature for this piece but had never seen it in the flesh. On our last visit we not only persuaded Mike to show it to us but also to release it. This piece needs and deserves to be displayed - the more you look at it the more you see and for me the more I love it. It has its own serenity and is very aptly named. A very special piece indeed.